The Tough Brands titanium tornado necklace is a fun necklace to wear to all your sporting events. Whether you like softball, basketball, baseball, or golf it’s a great accessory that makes you look tough on the field or court! The necklace is made by a triad of thick titanium threads. 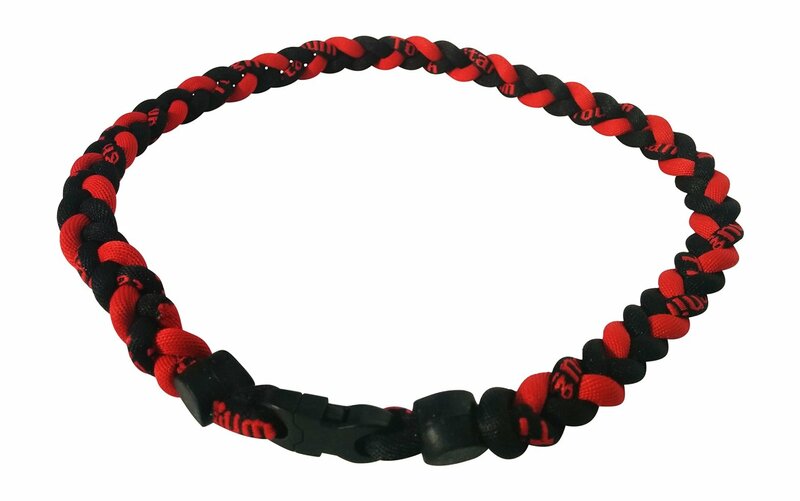 It gives the necklace a great braided looks that is very fun but still tough. It closes with an each snap clip so no struggling with those hook and eye closures. The thread is really strong and well made, no breaking concerns with this one. It comes in 14 different colors so you can get whatever color fits your style and personality. ULTIMATE SPORTS NECKLACE: Look and feel like a pro! KEEP YOUR EYES ON THE PRIZE: Tough Titanium necklaces can improve your concentration and focus when the game is on the line. DISCOVER YOUR TOUGH & DURABLE SIDEKICK: Wear your Tough Titanium on the baseball/softball diamond, golf course, chilly morning jogs, football field, basketball court, etc. or just as a way to show off your style and team. LOOK FOR THE PRO’S BRAND: All authentic necklaces say Tough Titanium on them. GUARANTEED SATISFACTION: The ONLY titanium tornado necklace with a 100% money back satisfaction guarantee. If you’re not 100% satisfied, we’ll rush you a FULL REFUND and let you keep your necklace! You can purchase one on Amazon!